I help on the shower planning committee for our church. 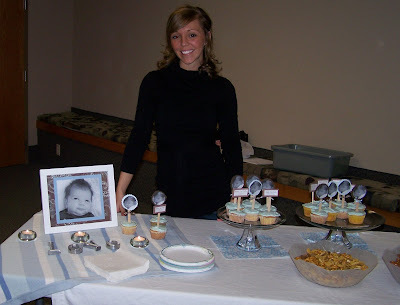 And we had a baby shower to host. One minor problem.....we have no funds. Our church has been cutting back in some areas of our expenses due to the economy. So this got my creative juices flowing. I called the mama that we were hosting the shower for and asked her if she could email me some pictures of her sweet little baby boy. I then printed and cut the baby face into circles. I taped some scrap card stock in her nursery colors to the back of the picture and cut around it with pinking shears. 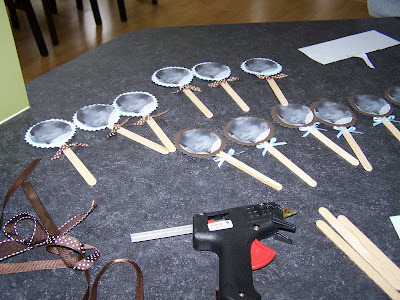 Then used some wooden craft sticks and hot glued them to the the circles. Used some left over ribbon from another project and made a bow, hot glue again. Waaaa laaaa....Cupcake toppers. This is William's baby blanket doubling as a table cloth. Some tea lights and silver letters I had from home. The picture is also emailed from the mama, printed off on our printer, & taped to some card stock I had from another project and the frame I had at home. 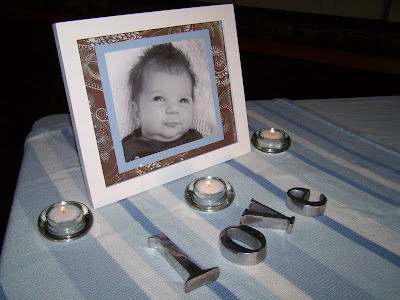 How fun to try to do the decorations from things you have already and have them turn out better than you thought. 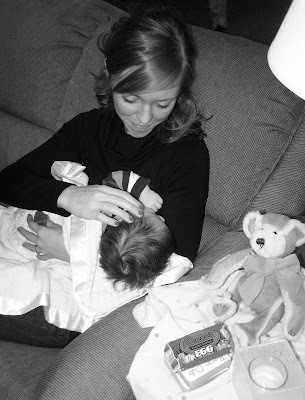 I felt so bad I asked to hold her baby Hudson and he started crying from the moment I held him. At the time of this picture his grandma was still walking him in the halls trying to settle him down. So sorry Amber. Here is Amber finally getting that cute little Hudson calmed down after I made him so mad. The shower was fun, and I was glad for the opportunity to get to know Amber a little better. Me: "Suzy when your done going poopy, call for mommy and I'll come wipe your bottom"
Suzy: "Mommy, when I call you to come wipe my bootie, you can say, "Yes ma'am." You amaze me! Great ideas. You are always good at showers, simple and great. Great to talk to you today...what a treat! Did you remember what you forgot? Way to make do with what you have. Nice job. I'm going to be doing a shower for my niece in a month or two. Maybe I should check in with you for ideas. Speaking of nieces.......it's been craft week at my house as well. 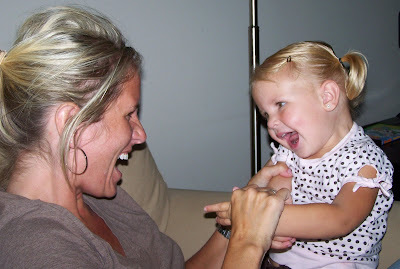 Until I can post pix on my blog, I may need to email one to you. Little miss Suzy sounds like a queen on her thrown, albeit a porceline one. ha! It all looks great! Way to use your creativity. I love the cupcake toppers. 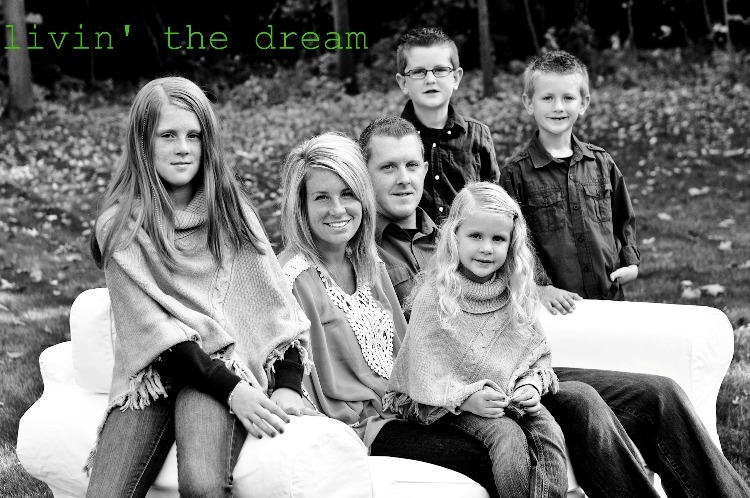 I love seeing your creativity, Heather! You have a gift!! The muffin toppers are so adorable and what a cute baby! "Yes Ma'am"... too cute! Did you do that?! What a great mother you are! You are so creative sister! Great job on everything! That little Suzy she is so sweet! Very cute...may have to steal those cupcake topper ideas for my son's birthday party!! I love them!!! Heather what a cute idea! It has been forever since I checked your blog so it was fun catching up! Thanks for the cute ideas... 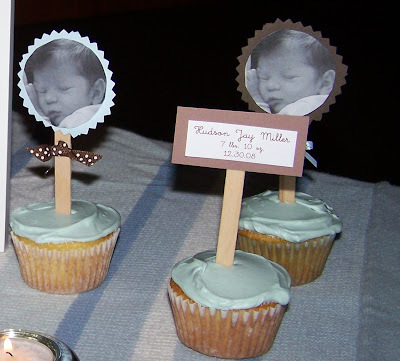 I have a shower coming up for a nephew who will be born in July so I will have to use these cute ideas!